I would like to dispute some information in Larry Master’s article about coyotes in the January/February issue of Adirondack Explorer. Coyotes do, indeed, need to be “managed” like any other wild game and/or furbearers. The current seasons for coyotes in most of New York State are from October 1 to March 25 for hunting and from October 25 to February 15 for trapping. These seasons, set by the Department of Environmental Conservation, protect the coyote during the time of birth and whelping of their young. There are always food sources for coyotes, including young grouse, turkeys, and fawns, as well as all the other food items that Mr. Master mentioned—and the occasional cat and small dog! In the central and western states, calves and sheep also make up much of their diet, which, as you can imagine, makes the coyote hated by ranchers and farmers. In areas of large coyote numbers, the red fox population has dwindled to nearly non-existent numbers with coyotes killing anything they can. I have seen firsthand what a coyote with sarcoptic mange looks like. If anyone thinks that nature’s way of eliminating coyotes with this disease is pleasant, I can assure you hunting or trapping is much more humane. Also, coyotes are not hunted and trapped only because they are “varmints”; their fur is quite valuable in the clothing industry for trim. 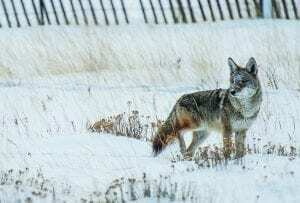 Given the sad days gone by, with unregulated taking of wolves, moose, beaver, cougar, lynx, and elk, as Mr. Master stated, I think it absolutely imperative that coyotes be managed with open and closed seasons. As has been demonstrated, regulated seasons have brought back excellent populations of beaver and wolves in the western states and a growing moose presence in the Adirondacks.